The icy worlds of Europa and Enceladus could never be habitable – because they suffer from either extreme hot or cold. NASA has said the mysterious moons of Jupiter and Saturn respectively could one day be home to humans. But scientist said the moons swing from a “icehouse” to “hothouse” without a “goldilocks” period when conditions are just right for life to thrive. The finding could have implications for the search for extra-terrestrial life as they are believed to be the likeliest places in the solar system to find it. Unlike the deserts of Mars they are both covered by oceans. The new global climate model shows some planets and moons like Europa and Enceladus change abruptly from extreme cold to extreme heat as their host star brightens – without passing through a habitable phase. It had been hoped such worlds in our Solar System – and those outside known as exoplanets – could become habitable after their ice cover melts. But these small worlds lack the geological processes of larger planets like Earth because they lose their heat faster. The evolution of their climate depends solely on the energy received from the host star. The computer simulation found Europa and Enceladus don’t have our planet’s active carbon cycle – which allowed it to recover from its snowball state to a perfect environment for life to thrive. Without atmospheric greenhouse gases to help warm the moon or planet the energy required to melt the ice is so high once it melts it goes straight a greenhouse state. The study published in Nature Geoscience showed the oceans vaporise making water disappear – resulting in a world unable to support life as we know it. Professor Jun Yang, of Peking University in Beijing, said: “Ongoing and future space missions aim to identify potentially habitable planets in our Solar System and beyond. “Planetary habitability is determined not only by a planet’s current stellar insolation and atmospheric properties but also by the evolutionary history of its climate. “It has been suggested that icy planets and moons become habitable after their initial ice shield melts as their host stars brighten. “Here we show from global climate model simulations that a habitable state is not achieved in the climatic evolution of those icy planets and moons that possess an inactive carbonate-silicate cycle and low concentrations of greenhouse gases. Carbon has been critical for the emergence of life and the regulation of our climate through the carbon-silicate cycle. It’s been debated how carbon-rich chemistry will affect the habitability of Europa and Enceladus. Prof Yang said: “We find the stellar radiation required to overcome a planet’s initial snowball state are so large that they lead to significant water loss and preclude a habitable planet. “Specifically, they exceed the moist greenhouse limit, at which water vapour accumulates at high altitudes where it can readily escape, or the runaway greenhouse limit, at which the strength of the greenhouse increases until the oceans boil away. 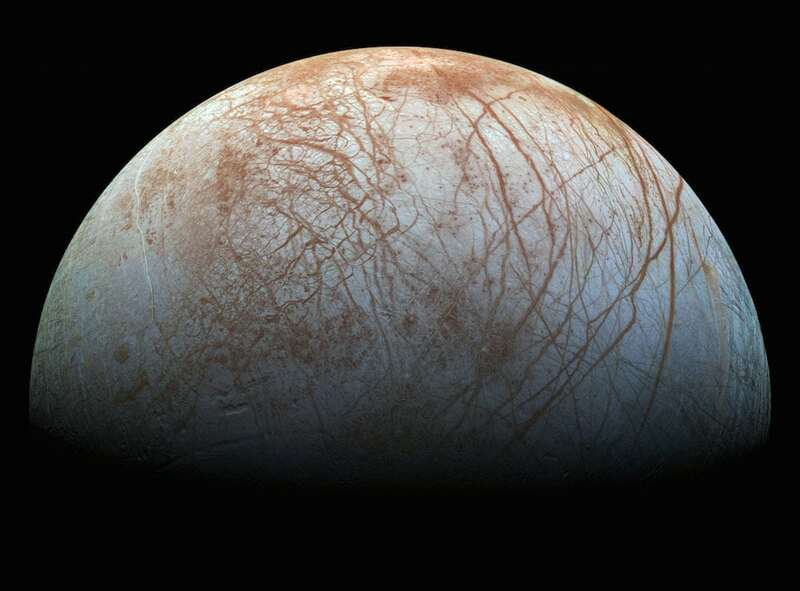 Jupiter’s icy moon Europa pictured by the probe Galileo and processed to an approximation of how it would look to the naked eye. Ganymede is Jupiter’s largest moon but has been said to have less potential for life because its oceans lacks a hydrothermal system. Prof Yang said: “Europa and Enceladus will have no habitable period. He explained: “The post-snowball Earth is hot but it is in neither a runaway nor a moist greenhouse state. Earlier this year NASA said life could be thriving in warm underground seas on Enceladus – even though it’s 887 million miles away from the Sun. Its Cassini spacecraft picked up the first evidence of chemical reactions capable of supporting microbes.